Telomeres prevent the ends of eukaryotic chromosomes from being recognized as damaged DNA and protect against cancer and ageing. When telomere structure is perturbed, a co-ordinated series of events promote arrest of the cell cycle so that cells carrying damaged telomeres do not divide. In order to better understand the eukaryotic response to telomere damage, budding yeast strains harboring a temperature sensitive allele of an essential telomere capping gene (cdc13-1) were subjected to a transcriptomic study. The genome-wide response to uncapped telomeres in yeast cdc13-1 strains, which have telomere capping defects at temperatures above approximately 27°C, was determined. Telomere uncapping in cdc13-1 strains is associated with the differential expression of over 600 transcripts. Transcripts affecting responses to DNA damage and diverse environmental stresses were statistically over-represented. BNA2, required for the biosynthesis of NAD+, is highly and significantly up-regulated upon telomere uncapping in cdc13-1 strains. We find that deletion of BNA2 and NPT1, which is also involved in NAD+ synthesis, suppresses the temperature sensitivity of cdc13-1 strains, indicating that NAD+ metabolism may be linked to telomere end protection. Our data support the hypothesis that the response to telomere uncapping is related to, but distinct from, the response to non-telomeric double-strand breaks. The induction of environmental stress responses may be a conserved feature of the eukaryotic response to telomere damage. BNA2, which is involved in NAD+ synthesis, plays previously unidentified roles in the cellular response to telomere uncapping. Telomeres are the specialized structures at the ends of linear eukaryotic chromosomes [1, 2]. Their fundamental configuration is conserved in most eukaryotes and consists of repetitive DNA elements with single-stranded (ss) 3' G-rich overhangs. Telomeres are bound by numerous proteins with specificity for both double-stranded DNA (dsDNA) and the ss overhangs  and telomere 'capping' function is critical in preventing the cell from recognizing the chromosome ends as double-strand breaks (DSBs) [1, 3]. Telomeres also need to circumvent the 'end replication problem', which is due to the inability of DNA polymerases to fully replicate chromosome ends . In the presence of telomerase, a reverse transcriptase that uses an RNA template to add telomeric DNA, chromosome ends are maintained by the addition of DNA repeats . In budding yeast and mammalian cells not expressing telomerase, telomeres get progressively shorter with every cell division until they eventually reach a critically short length that is sensed by the DNA-damage apparatus and promotes a cell cycle arrest and replicative senescence [3, 5–7]. Cell cycle arrest also occurs when telomere damage is caused by absence or loss of function of telomere capping proteins [3, 8–10]. Telomere degeneration is probably relevant to human cancer and aging . In many human somatic tissues, telomeres become progressively shorter with increasing number of cell divisions. Additionally, age related diseases and premature aging syndromes have been characterized by short telomeres and are associated with altered functioning of both telomerase and telomere-interacting proteins. Regulation of telomere length is also relevant to cancer since, in the majority of human tumors and cancer cell lines thus far examined, telomerase is inappropriately activated, permitting cells to divide indefinitely. Cdc13 is an essential telomere binding protein in Saccharomyces cerevisiae. Cdc13 is the functional homologue of human Pot1 in that it binds the ss G-tail [12, 13]. Cdc13 is involved in telomere length homeostasis, due, at least in part, to its role in the recruitment of the catalytic subunit of telomerase [14–16]. The critical role of Cdc13, however, appears to be in telomere end protection. When Cdc13 is present, telomeres are capped and DNA-damage responses, which would be elicited if telomeres were perceived as DSBs, are suppressed . In the absence of functional Cdc13, uncapping occurs and the resulting dysfunctional telomeres become substrates of the DNA damage response pathway, leading to accumulation of ssDNA at telomeres [9, 17], activation of a DNA damage checkpoint [9, 18] and eventually cell death [19, 20]. CDC13 is an essential gene; however, temperature sensitive alleles such as cdc13-1 allow telomeres to be conditionally uncapped and the resulting cellular response to be studied in detail. This has facilitated identification of the genes required for checkpoint arrest of cdc13-1 strains [1, 3, 18, 21]. Telomere uncapping in cdc13-1 strains induces rapid and efficient cell cycle arrest, like many types of DNA damage. Whether uncapped telomeres elicit a different response to that to a DSB elsewhere in the genome remains unknown. A genome-wide analysis of the transcriptional response of yeast to deletion of the telomerase RNA subunit revealed that when telomeres become critically short, changes in gene expression overlap with those associated with a number of cellular responses, including the DNA damage response, but also possess unique features that suggest that shortened telomeres invoke a specific cellular response . Telomere damage suffered by yeast cells that lack functional telomerase takes several days to manifest and does so heterogeneously within populations of cells . In contrast, telomere uncapping in cdc13-1 strains exposed to the restrictive temperature is rapid and synchronous, with over 80% of cells within a population exhibiting the G2-M cell cycle arrest indicative of telomere uncapping within a single cell cycle . We hypothesized that, while the response to telomere uncapping in cdc13-1 strains was likely to overlap with the response to telomerase deletion and DNA damage responses, rapid telomere uncapping in cdc13-1 strains would induce an acute response to telomere damage that would allow us to better dissect, and therefore understand, the response to telomere uncapping. In this paper, we used DNA microarray analyses to determine the genome-wide response to telomere uncapping in cdc13-1 yeast strains. We show that genes differentially expressed upon telomere uncapping show similarities to expression programs induced by other conditions, such as exogenous cellular stresses and the absence of telomerase. BNA2, encoding an enzyme required for de novo NAD+ synthesis, was one of the most highly and significantly up-regulated genes upon telomere uncapping in cdc13-1 strains and has no known function in telomere metabolism. We show that deletion of BNA2 suppresses the temperature sensitivity of cdc13-1 strains; thus, BNA2 plays a role in chromosome end protection. In order to better understand the eukaryotic response to uncapped telomeres, we examined the genome-wide expression changes associated with telomere uncapping in cdc13-1 yeast strains. We first sought to determine appropriate conditions to induce telomere uncapping in temperature-sensitive cdc13-1 mutants. The method commonly employed to promote uncapping is to switch from growth at a permissive temperature of 23°C to a restrictive temperature of 36°C or 37°C , close to the maximum temperature (38-39°C) at which wild-type yeast can grow. Transcriptomic profiling of yeast lacking functional telomerase  demonstrated that telomere damage affects expression of heat shock genes [22, 24]. Since a change of culture temperature from 23°C to 36-37°C would also be sensed as a heat shock, and could potentially cause similar changes in gene expression to those that occur specifically as a result of telomere uncapping, we first tested whether a lower restrictive temperature was able to induce telomere uncapping without a strong heat shock response. We compared restrictive temperatures of 30°C (the optimum growth temperature for wild-type yeast) and 36°C in cdc13-1 strains. We first compared the kinetics of cell cycle arrest in cdc13-1 cultures transferred from 23°C to 30°C or 36°C (Figure 1a). 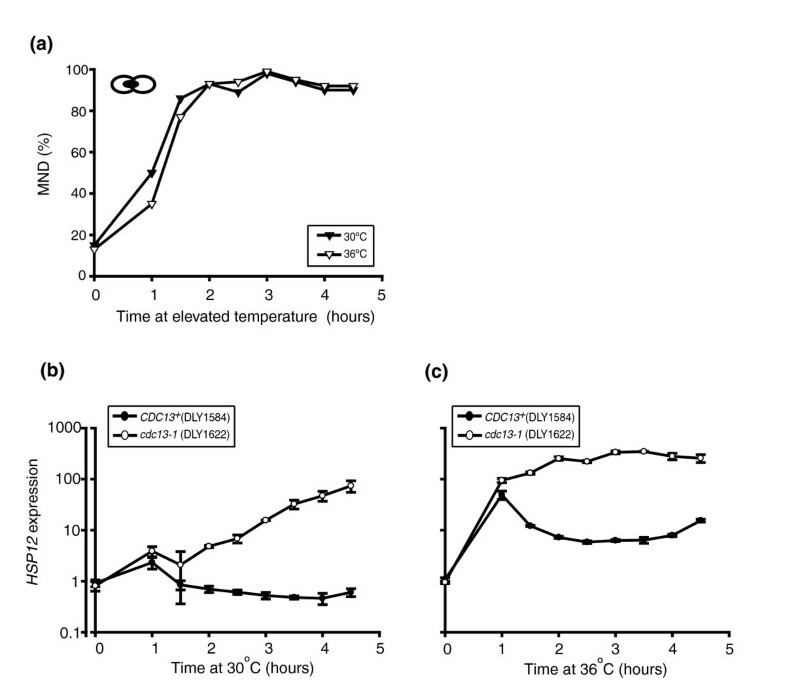 cdc13-1 strains transferred to 30°C underwent a G2-M cell cycle arrest with broadly similar kinetics to those transferred to 36°C, with over 80% of cells in each culture arresting within 2 hours of the temperature shift. Secondly, quantitative RT-PCR was used to examine gene expression in cdc13-1 and CDC13+ strains (Figure 1b,c; Additional data file 1). We examined expression of HSP12, which is robustly induced in response to heat stress  and also when telomeres are critically short in telomerase deletion mutants . In the CDC13+ strain, elevating the culture temperature to 30°C caused a mild heat shock, as indicated by 2.3-fold up-regulation of HSP12 1 hour after altering the temperature (Figure 1b). For the remainder of the time course, HSP12 expression returned to levels slightly below those that were observed before the temperature shift. In the cdc13-1 strain after 1 hour of incubation at 30°C, HSP12 was up-regulated 3.9-fold above levels in the T = 0 sample. By 90 minutes, this induction was reduced to 2.1-fold but then rose steadily at each subsequent time point, presumably due to telomere uncapping, until 4 hours after the temperature shift, when HSP12 was 74-fold up-regulated (Figure 1b). Comparison of 30°C and 36°C as restrictive temperatures. (a) Two independent cultures of a cdc13-1 strain (DLY1622) grown at 23°C, were sampled. One culture was transferred to 30°C (filled triangles) and the other to 36°C (open triangles). Fractions of each culture arrested at medial nuclear division (MND) are shown. (b) cdc13-1 (DLY1622; open circles) and CDC13+ (DLY1584; filled circles) strains, grown at 23°C, were transferred to 30°C and samples taken as indicated. RNA was prepared and HSP12 transcripts were quantified using one-step quantitative RT-PCR. Plotted values represent the means of three independent measurements of each sample and error bars represent the standard deviations of the means. Correction factors to normalize HSP12 RNA concentrations of each sample were generated by calculating the geometric means of three loading controls, ACT1, PAC2 and BUD6. A single T = 0 sample from the CDC13+ strain was assigned the value of 1 and all other values were corrected relative to this. (c) This experiment was carried out as described in (c), except cdc13-1 and CDC13+ strains were transferred to the restrictive temperature of 36°C. As expected, switching from growth at 23°C to 36°C induced a stronger heat shock response than switching to 30°C. In the CDC13+ strain, 1 hour of exposure to 36°C induced HSP12 expression 49-fold above levels in the T = 0 sample (Figure 1c). At later time points, HSP12 up-regulation in the CDC13+ strain subsided, although expression was still elevated between 6- and 15-fold above those measured pre-induction. Expression of HSP12 in the cdc13-1 strain transferred to 36°C was up-regulated 94-fold after 1 hour and this increased to levels between 132- and 347-fold above the T = 0 sample for the remainder of the time course (Figure 1c). Additionally, we measured the expression of CTT1 and MSC1 in cdc13-1 and CDC13+ strains that had been transferred from 23°C to 30°C or 36°C (Additional data file 1). Both of these genes are also up-regulated in response to heat shock  and the absence of telomerase . For CTT1, a shift to 36°C induced a stronger heat shock response in CDC13+ strains than a shift to 30°C. 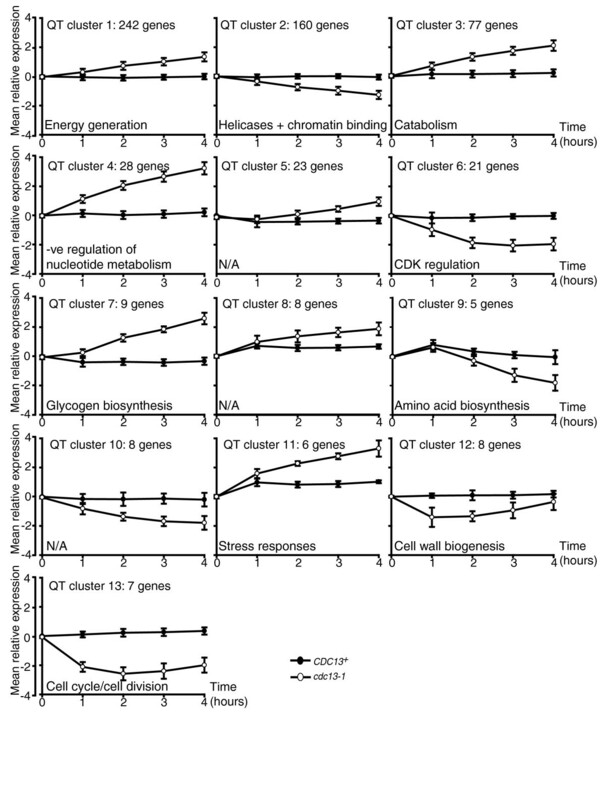 For MSC1, neither 30°C nor 36°C appreciably induced gene expression in CDC13+ strains. For both of these genes (and also HSP12), differential expression in cdc13-1 strains compared to CDC13+ was readily detectible after a shift to 30°C, indicating that this temperature induces telomere uncapping. Both 30°C and 36°C can induce heat shock but, as expected, this effect is also more appreciable at 36°C. We decided that 30°C was a suitable restrictive temperature for examination of the transcriptional response to telomere uncapping as this temperature induces telomere uncapping in cdc13-1 strains whilst causing minimal heat stress. In order to generate a robust data set, a multi-time-point time course and three biological replicates of each strain were used (Figure 2a). To produce independent biological replicates, we performed a genetic cross between a CDC13+ and a cdc13-1 strain to generate three cdc13-1 and three CDC13+ strains. 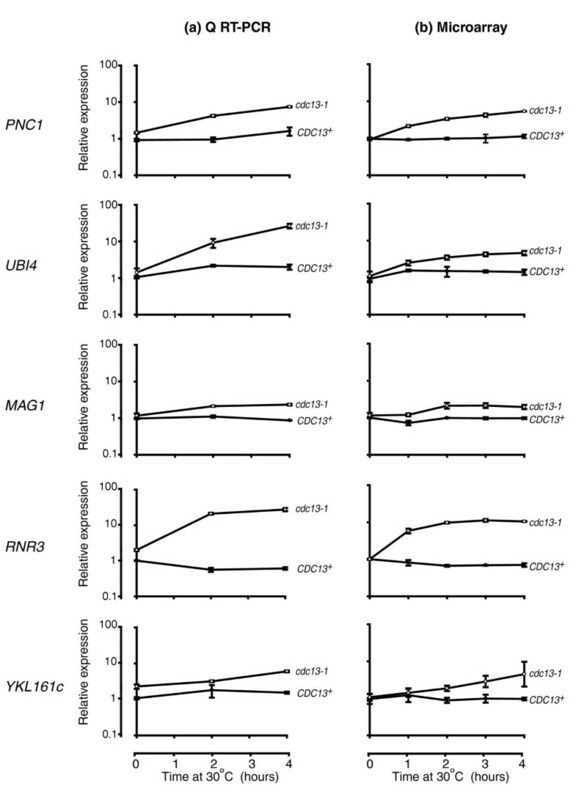 The resulting sets of strains demonstrated reproducible cell cycle arrest, growth, viability and HSP12 expression upon exposure to the 30°C restrictive temperature (Additional data file 2). Strains were in the S288C genetic background since the S. cerevisiae genome sequence was derived from an S288C strain and oligonucleotides on microarray chips are based upon the published genome sequence. Additionally, other large scale genetic screens carried out in our and other laboratories have used this strain background. Genome wide expression changes in response to telomere uncapping. (a) Schematic representation of microarray time courses. For each of the three separate time course experiments, one CDC13+ and one cdc13-1 strain were inoculated into liquid culture and grown to early log phase at 23°C. Samples were taken (T = 0) and strains were transferred to 30°C with further samples taken every 30 minutes from 1 to 4.5 hours thereafter. Samples from 1, 2, 3 and 4 hours after the temperature shift (T = 1 - T = 4) were used for the array experiment and the remaining samples were stored. (b) Bioconductor was used to hierarchically cluster the 647 differentially expressed genes (DEGs) such that genes whose expression patterns are similar across the time course cluster together. Pearson correlation was used as the similarity measure and average linkage as the clustering algorithm. Expression levels are the averages of the three biological replicates of each sample. Each row represents the expression pattern of a single gene. Each column represents expression levels at a single time point. CDC13+ strains are on the left and cdc13-1 strains on the right. Gene names are on the right. Genes shown in yellow are up-regulated, genes shown in blue are down-regulated, while those shown in black are unchanged. All expression values are relative to the T = 0 time point in CDC13+ strains. Log2 fold-change values are shown. Maximum induction or repression is 2(4)-fold. cDNAs generated from the three cdc13-1 and three CDC13+ strains treated as in Figure 2a were analyzed using Affymetrix GeneChip® Yeast Genome 2.0 arrays. The entire dataset can be downloaded from the ArrayExpress website, accession number E-MEXP-1551. We used limma  to compare transcript levels between CDC13+ and cdc13-1 strains at each time point and identified 647 genes with at least two-fold changes in expression levels between cdc13-1 and CDC13+ strains and where the differences between cdc13-1 and CDC13+ strains showed statistically significant p-values (≤ 0.05; Figure 2b; Table A in Additional data file 3). Of these genes, 229 were down-regulated upon telomere uncapping and 418 were up-regulated. Analysis of the lists of up- and down-regulated genes using GOstats , which identifies statistically over-represented Gene Ontology (GO) terms, revealed that the up-regulated list was enriched for genes involved in processes including carbohydrate metabolism, energy generation and the response to oxidative stress (Table A in Additional data file 4) while the down-regulated list was enriched for genes with roles in processes including amino acid and ribosome biogenesis, RNA metabolism and chromatin modification (Table B in Additional data file 4). Hierarchical clustering was used to investigate the relationships between the differentially expressed genes. This clustering algorithm groups genes with similar expression profiles (Figure 2b). During the time course, the number of differentially expressed genes increased with time (Figure 2b) and almost all of the changes occurring at early time points persisted for the duration of the experiment (Table 1 and Figure 2b). There were no differences in gene expression between cdc13-1 and CDC13+ strains before the temperature shift, indicating that in cdc13-1 strains, telomeres are functionally capped at 23°C (Figure 2b). In CDC13+ strains, the expression of 41 genes was altered during the time course. Analysis of this gene list using GOstats  demonstrated that genes with roles in cell division and the cell cycle were over-represented in this list (Table C in Additional data file 4). Total numbers of differentially expressed genes (DEGs) at each time point and those that were not differentially expressed at the previous time point are listed. In order to validate the microarray data, we used quantitative RT-PCR to examine the expression of five of the up-regulated genes in a set of RNA samples that had been used in the array analysis (Figure 3a). This confirmed that all of the genes examined were up-regulated in cdc13-1 relative to CDC13+. Expression patterns of these same genes in cdc13-1 and CDC13+ strains throughout the microarray time course were also examined (Figure 3b). Comparison between gene expression in the microarray experiments with quantitative RT-PCR revealed that while the RT-PCR broadly agreed with the array data, for UBI4 there were differences between gene expression levels quantified using these methods. This may be due to the smaller dynamic range of arrays compared to quantitative RT-PCR. As expected from our pre-array RT-PCR analysis (Figure 1c,d; Additional data file 1), HSP12, CTT1 and MSC1 were up-regulated in our microarray experiment. We plotted the expression of these genes throughout the microarray time course (Additional data file 5) and observed that expression patterns were very similar to those that we had observed by RT-PCR, although like UBI4, expression levels of HSP12 measured in the array were lower than those quantified by RT-PCR. Validation of microarray data. (a) RNA from a single set of time course samples (CDC13+ (DLY3108; filled circles) and cdc13-1 (DLY3102; open circles)) was subjected to quantitative RT-PCR. Transcript levels of PNC1, UBI4, MAG1, RNR3, and YKL161C were analyzed in triplicate. Error bars represent the standard deviations of the means. Correction factors to normalize RNA concentrations were generated by calculating the geometric means of ACT1 and PAC2. A single T = 0 sample from the CDC13+ strain was assigned the value of 1 and all other values were corrected relative to this. (b) Normalized expression values from the microarray experiment of the five genes of interest quantified and plotted as in (a). The transcriptomic response to telomere uncapping in cdc13-1 strains was expected to overlap with the response to absence of telomerase , since in both cases damaged telomeres activate a checkpoint response. Telomerase deletion is associated with the differential expression of genes involved in processes including the DNA-damage response (DDR) [27, 28] and the environmental stress response (ESR) . A significant proportion of the genes differentially expressed in cdc13-1 strains were also involved in similar responses to these (see below for further details), suggesting that different types of telomere damage invoke common biological processes. Direct comparison of the cdc13-1 dataset with the 581 genes altered in the absence of telomerase  showed that 244 genes were common to both (Table A in Additional data file 6). The overlap may encompass genes whose expression is altered universally in response to telomere damage and includes the DNA damage response genes RAD51, RNR2, RNR3 and RNR4. There were 230 genes up-regulated in cdc13-1 strains but not in the response to telomerase deletion (Table B in Additional data file 6). These include the DNA damage response genes DUN1, RAD16, MAG1, DDR2 and HUG1, and MSN4, which encodes a key transcription factor in the response to environmental stresses . Under conditions of stress, Msn4 and a related protein, Msn2, bind to defined promoter elements called 'stress response elements' (STREs); 36% of genes up-regulated in cdc13-1 strains possess STREs (p ≤ 10 e-15), while only 18% of genes down-regulated in cdc13-1 strains possess such elements (p = 0.526). Therefore, it is probable that up-regulation of MSN4 in the response to telomere uncapping is responsible for the downstream induction of many genes. Some of the genes differentially expressed in the cdc13-1 experiment but not in response to telomerase deletion may respond specifically to acute telomere damage, while some genes in the tlc1Δ data set but not cdc13-1 may be specific to an adaptive response that occurs as cells gradually adapt to telomere erosion over a number of days. We envisaged that because cdc13-1 strains undergo a rapid cell cycle arrest when telomeres are uncapped, use of this system may allow us to identify genes that are involved in the acute response to telomere uncapping. One hour after the temperature shift, the DDR genes DUN1, HUG1, RAD51, RNR2 and RNR3 were already up-regulated in cdc13-1 strains, indicating that damaged telomeres had already been sensed, despite cell cycle arrest not having yet reached maximum levels (Figure 2). DUN1 and HUG1 were not identified as differentially expressed in tlc1Δ strains . Differences in gene expression between cdc13-1 strains and those lacking telomerase are likely to be due to a number of factors. Firstly, different genes may be altered due to responses to distinct types of telomere damage. Secondly, in a population of cells lacking telomerase, erosion of telomeres and cell cycle arrest occur heterogeneously and over a period of days rather than hours , making transcriptional differences less polarized (and thus more difficult to detect) than in a population of rapidly and synchronously arrested cdc13-1 cells. Also, because of heterogeneity of entry into senescence between cultures of telomerase deficient strains , results from biological replicates cannot be readily combined to allow statistical analyses such as the ones that we have employed. Additionally, some differences between differentially expressed genes identified in these two experiments are likely because the studies were carried out using different types of arrays and because different algorithms have been used to identify altered gene expression. cdc13-1 strains at the restrictive temperature arrest in the G2-M phase of the cell cycle , while CDC13+ cells continue to divide. 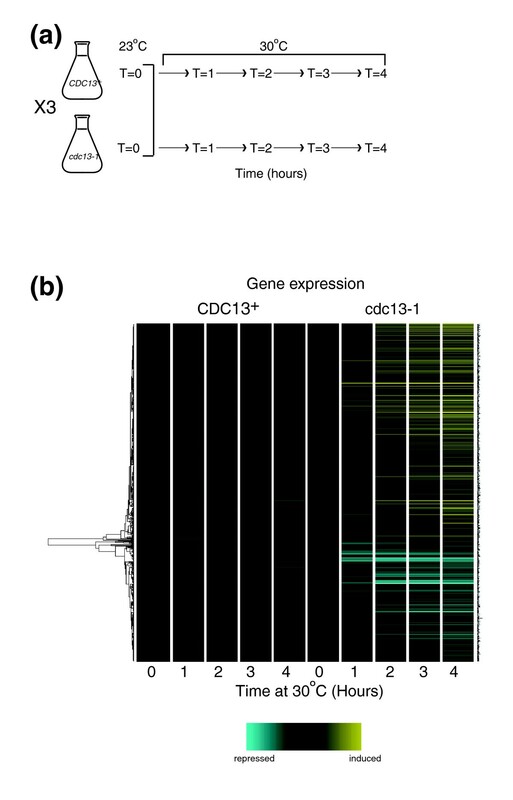 Therefore, the differential expression of many genes in cdc13-1 strains is likely a result of enrichment/depletion of cell cycle-regulated transcripts at the arrest point compared to levels in asynchronous cycling controls. Of the 647 differentially regulated genes in cdc13-1 strains, 256 were shown to be periodically expressed during a recent, comprehensive study of the cell division cycle . A hypergeometric test confirmed that periodically expressed transcripts were over-represented in our data set (p ≤ 10e-15; Table 2). Changes in gene expression in cdc13-1 strains displayed a distinct temporal pattern in that total numbers of differentially expressed genes increased at each time point (Figures 2b and 4a), while cell cycle regulated genes represented an increasingly smaller proportion of the total numbers of differentially expressed genes at each time point (Figure 4a,b). Over 50% of the genes that are differentially expressed upon telomere uncapping in cdc13-1 strains are not known to be cell cycle regulated; thus, the majority of the observed changes do not seem to be attributable to the G2-M arrest. We subtracted the genes that are known to be cell cycle regulated from our list of 647 differentially expressed genes and subjected the remaining 391 to a GOstats analysis (Table D in Additional data file 4). This list is enriched for genes involved in energy generation and genes involved in nicotinamide metabolism are also over-represented in it (p = 3.7e-4). Expression of cell cycle-regulated genes. (a) Total numbers of differentially expressed genes (DEGs) at each time point (filled circles) and numbers of genes at each time point that have been previously classified as cell cycle regulated  (open circles) are shown. (b) Percentage of total number of differentially regulated genes at each time point that have been classified as cell cycle regulated  are shown. It has recently been shown that budding yeast cells disrupted for all S-phase and mitotic cyclins still express nearly 70% of periodic genes periodically and on schedule, despite being arrested at the G1-S border . Thus, it is possible that despite cdc13-1 strains being arrested at G2-M, this may have a relatively limited effect upon periodic gene expression. Uncapped telomeres are sensed by cells as if they were DSBs [9, 18]; thus, the response to telomere uncapping is expected to share features in common with the DDR. Accordingly, many of the genes differentially expressed in cdc13-1 strains have previously been shown to respond to any one of three types of DNA damaging event, namely exposure to ionizing radiation , treatment with methyl methanesulfonate , or induction of a single, unrepaired cut by HO endonuclease . A hypergeometric test confirmed that genes differentially expressed in response to any of these types of DNA damaging insult were over-represented in our data set (p ≤ 10 e-15; Table 2). This could be due, at least in part, to the fact that DSBs induce cell cycle arrest at G2-M similarly to uncapped telomeres and, thus, the same sets of transcripts will be enriched/depleted at the arrest point in all cases. In order to account for this effect, we subtracted cell cycle regulated genes  from the list of genes differentially expressed in cdc13-1 strains and compared the remaining genes to those that are expressed in response to DNA damage [27, 28]. Of the genes altered in cdc13-1 that are not cell cycle regulated, 35% are also involved in responses to DNA damage, and a hypergeometric test confirmed that the over-representation of DDR genes in this group was statistically significant (p ≤ 10e-15). While genes whose expression is altered in response to telomere uncapping in cdc13-1 strains overlap with those whose expression changes in response to other types of DNA damage, the majority of the altered genes have not been implicated in the DDR, suggesting that uncapped telomeres are not simply sensed as DSBs by cells. Genome-wide responses to absence of telomerase and to DNA damaging agents share features in common with the ESR. The ESR involves approximately 900 genes whose expression is stereotypically altered in response to diverse environmental conditions . A hypergeometric test confirmed that ESR genes were over-represented in our data set (p ≤ 10e-15; Table 2). GOstats analysis also demonstrated that significant numbers of genes involved in the response to oxidative stress are present in the list of genes up-regulated in cdc13-1 strains (Table A in Additional data file 4). In order to identify transcriptional regulators whose expression is altered in cdc13-1 strains, we compared our list of differentially expressed genes to a list of 203 known yeast transcription factors . Fourteen genes encoding transcriptional regulators were up-regulated in cdc13-1 strains (Table A in Additional data file 7). Some of the up-regulated transcription factors are known to play roles in glucose metabolism while MSN4 plays a key role in the ESR (see above). Fourteen genes encoding transcriptional regulators were also down-regulated in cdc13-1 strains (Table B in Additional data file 7). The down-regulated transcription factors appeared to possess diverse roles and worthy of note is the telomeric silencing role of RAP1. In order to identify groups of genes that may be co-regulated and/or involved in the same pathways or processes, we subjected genes differentially expressed in cdc13-1 strains to a 'quality threshold' (QT) clustering analysis  (Figure 5). This analysis uses an algorithm that groups genes non-hierarchically into high quality clusters based upon similarity in expression patterns. The QT clustering analysis revealed that all but 45 of the genes differentially regulated in cdc13-1 strains can be grouped into 13 QT clusters (Figure 5; Tables B-N in Additional data file 3). In order to identify common properties of genes in each cluster, we used hypergeometric tests to determine whether single clusters had higher than expected numbers of genes that had been implicated in the DDR, the ESR, or were known to be cell cycle regulated (Table 2). Additionally, we carried out a GOstats analysis  to determine whether the lists were enriched for genes associated with particular GO terms (Figure 5; Tables E-Q in Additional data file 4). The majority of the QT clusters were enriched for genes with specific GO terms and/or exhibited over-representation of genes involved in the DDR, the ESR or the cell cycle (Table 2). Thus, within some of the sets of co-expressed genes there are significant proportions that clearly share common functions and, as such, their co-ordinate expression may be critical for the cell to mount its response to uncapped telomeres. Quality threshold (QT) clustering analysis of genes differentially expressed upon telomere uncapping. Bioconductor was used to execute a QT clustering analysis  of the 647 differentially expressed genes (DEGs). A Euclidean similarity measure was used. Minimum cluster size was 5 and maximum radius of clusters was 1.0. Mean expression values of the genes in each cluster relative to the wild-type T = 0 samples were plotted with error bars representing standard deviations from the mean. Over-represented GO terms for each cluster are indicated. Genes with direct roles in telomere function were scarce in the cdc13-1 dataset and, accordingly, GOstats did not identify genes whose products have telomeric roles as being over-represented. Three genes with established roles in telomere maintenance were down-regulated in cdc13-1 strains (HEK2, RAP1 and TBF1), while ESC8, which is involved in chromatin silencing at telomeres, was up-regulated. Two separate large scale screens have identified a total of 248 genes that contribute to maintenance of normal telomere length [33, 34]. Direct comparison of the cdc13-1 gene expression data set to these showed that five of the up-regulated genes (DUN1, GUP2, PPE1, YBR284W and YSP3) overlapped with these datasets while six of the down-regulated genes (HTL1, LRP1, RPB9, RRP8, BRE1 and NPL6) have been shown to play a role in telomere length maintenance. In a separate study, our laboratory has carried out a genome-wide screen that has identified more than 240 gene deletions that suppress the temperature sensitivity of cdc13-1 strains and, thus, may play specific roles in telomere capping . With the aim of identifying differentially expressed genes with novel telomeric roles, we compared the list of cdc13-1 suppressors to genes differentially expressed in the cdc13-1 microarrays, and found that 22 genes were common to both (Figure 6a and Table 3). In order to extend the comparison between the two data sets, we used Biogrid [36, 37] and Osprey  to identify and visualize functional relationships between differentially expressed genes and those whose deletion suppresses cdc13-1 temperature sensitivity. These functional relationships are based upon protein-protein interactions, co-lethality, co-expression across large numbers of microarray experiments and co-citation in the literature. We were particularly interested in a gene called BNA2, because it was highly and significantly up-regulated in cdc13-1 strains (Figure 6b). Differential expression of BNA2 was not observed in the absence of telomerase , although it is expressed in response to environmental stress . Biogrid analysis revealed that BNA2 interacts genetically with a cdc13-1 suppressor, NPT1 , as co-deletion of these genes is synthetically lethal (Figure 6c). NPT1 is not differentially expressed when telomeres are uncapped in cdc3-1 strains. BNA2 encodes a tryptophan 2,3-dioxygenase required for biosynthesis of nicotinic acid (an NAD+ precursor) from tryptophan via the kynurenine pathway , while NPT1 encodes a nicotinate phosphoribosyltransferase that acts in the salvage pathway of NAD+ biosynthesis and is required for telomeric silencing . Twenty-two genes whose expression is altered in cdc13-1 strains and that are also suppressors of cdc13-1 temperature sensitivity . 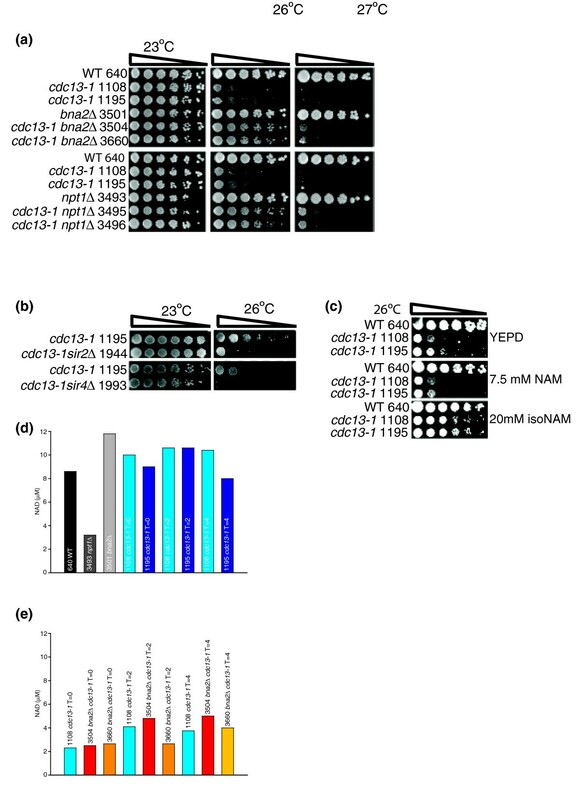 Differentially expressed genes that suppress the temperature sensitivity of cdc13-1. (a) Genes that were differentially expressed in cdc13-1 strains and those that suppress cdc13-1 temperature sensitivity  were plotted using a Venn diagram. (b) Normalized BNA2 expression values from the microarray experiment are plotted as in Figure 3. (c) Functional interactions between BNA2 and genes differentially expressed in cdc13-1 strains or whose deletion suppresses temperature sensitivity of cdc13-1 were identified and visualized using Biogrid and OSPREY. Nodes shown in light grey represent genes from the cdc13-1 microarray data set, while nodes shown in dark grey represent genes whose deletion suppresses cdc13-1 temperature sensitivity. Edges represent functional interactions. The edge connecting BNA2 and NPT1 represents a 'synthetic lethality' interaction. In order to determine whether BNA2, like NPT1, interacts genetically with cdc13-1, we deleted BNA2 and NPT1 in the W303 strain background and compared the abilities of these gene deletions to suppress the temperature sensitivity of cdc13-1 strains. Deletion of BNA2 suppresses the temperature sensitivity of cdc13-1 strains to similar levels as deletion of NPT1, allowing cells to grow at 26°C (Figure 7a). NAD+ biosynthetic genes and Sirtuin function. (a) Six-fold serial dilutions of the indicated strains were spotted onto YEPD plates and grown for 3 days at the indicated temperatures before being photographed. WT, wild type. (b) Six-fold serial dilutions of the indicated strains were spotted onto YEPD plates and grown for 3 days at the indicated temperatures before being photographed. (c) Six-fold serial dilutions of the indicated strains were spotted onto YEPD plates, YEPD plates containing 7.5 mM nicotinamide and YEPD plates containing 20 mM isonicotinamide, and grown for 3 days at the indicated temperatures before being photographed. (d) NAD+ levels in indicated strains; values represent the mean of two measurements. (e) NAD+ levels in indicated strains; values represent the mean of two measurements. NAD+ is a ubiquitous biomolecule that is essential for life in all organisms, both as a coenzyme for oxidoreductases and as a source of ADP ribosyl groups . We wondered whether there may be a link between NAD+ metabolism and telomere uncapping. NPT1 and BNA2 are both involved in NAD+ biosynthesis and deletion of both suppresses the temperature sensitivity of cdc13-1 strains. Additionally, genes associated with the GO term 'nicotinamide metabolic process' are over-represented in a list of cdc13-1 differentially expressed genes that are not cell cycle regulated (Table D in Additional data file 4). 'Nicotinamide metabolic process' is a GO term that encompasses genes involved in both the synthesis and the consumption of NAD+ and its derivatives . The majority of the differentially expressed genes associated with this GO term are up-regulated. Three genes with direct roles in NAD+ biosynthesis are differentially expressed when telomeres are uncapped in cdc13-1 strains. BNA2 and PNC1, which is involved in the NAD salvage pathway , are up-regulated, while a down-regulated gene, NMA1 , plays roles in both the salvage and the de novo pathways. Because a yeast cell must be able to utilize at least one of these pathways to survive and NMA1 is not an essential gene, NMA1 is clearly not vital for the synthesis of NAD+. This may be because there is a second enzyme called Nma2 with the same biochemical activity as Nma1. Thus, up-regulation of BNA2 and PNC1 could lead to increased NAD+ synthesis when telomeres are uncapped. Increased NAD+ levels may be required for the response to telomere uncapping because biological processes that increase in cdc13-1 strains include energy production and oxidative phosphorylation (Table A in Additional data file 4), which require NAD+ and other up-regulated 'nicotinamide metabolic process' genes that encode products that utilize NAD+ or its derivatives, including NDE1 and NDE2, which are involved in NADH oxidation, and YEF1, GND2, and SOL4, which are involved in the synthesis of NADP or NADPH. NAD+ is also required for the activity of Sirtuins, which are deacetylases with conserved roles in DNA repair, heterochromatin formation and lifespan determination . Telomere maintenance appears to be a conserved function of Sirtuins as, in yeast, they are known to play roles in telomeric silencing , and SIRT6, a human Sirtuin, is required for modulation of telomeric chromatin . We wondered whether deletion of BNA2 suppresses cdc13-1 temperature sensitivity via an effect upon Sirtuin function. We hypothesized that bna2Δ strains may contain reduced NAD+ levels when telomeres are uncapped. This may cause decreased Sirtuin activity, leading to reduction of telomeric silencing and increasing accessibility of uncapped chromosomes to the DNA repair machinery. If deletion of BNA2 rescues the temperature sensitivity of cdc13-1 strains via a reduction in Sirtuin function, deletion of Sirtuin genes should also have positive effects upon the growth of cdc13-1 mutants at high temperatures. To test this, we deleted SIR2, and the functionally related SIR4 gene, in cdc13-1 strains. However, in contrast to deletion of BNA2, deletion of SIR2 or SIR4 exacerbates the temperature sensitive phenotype of cdc13-1 strains (Figure 7b). Therefore, we conclude that because deletion of BNA2 has opposite effects upon the temperature sensitivity of cdc13-1 to deletions of SIR2 or SIR4, bna2Δ does not suppress cdc13-1 by inhibiting Sirtuin function. To confirm this, we also grew cdc13-1 strains in the presence of nicotinamide, which inhibits Sirtuin function. Consistent with our observation that abrogation of Sirtuin function is deleterious to cdc13-1 strains, nicotinamide inhibited the growth of cdc13-1 strains, while isonicotinamide, which stimulates Sirtuin function, enhanced the growth of cdc13-1 strains (Figure 7c). To determine whether BNA2 is required to maintain NAD+ levels upon telomere uncapping in cdc13-1 strains, we directly quantified intracellular NAD+. Firstly, we measured NAD+ in wild type, npt1Δ, bna2Δ and cdc13-1 strains grown in rich medium at 23°C (Figure 7d). Deletion of BNA2 did not reduce NAD+ levels under these growth conditions. This was expected because deletion of BNA1, which is in the same linear NAD+ biosynthetic pathway as BNA2, has no discernible effects upon intracellular NAD+ levels unless nicotinic acid is limiting . In contrast, and as previously observed , deletion of NPT1 did lead to a reduction in intracellular NAD+ levels. At 23°C, NAD+ levels in cdc13-1 strains were comparable to those recorded in wild-type strains. We also measured NAD+ levels after telomere uncapping in cdc13-1 strains 2 and 4 hours after a shift to 30°C, and showed that they did not change notably (Figure 7d). In order to determine whether BNA2 is required to augment NAD+ consumed during the response to telomere uncapping, we also examined NAD+ levels in cdc13-1 bna2Δ strains before and after telomere uncapping (Figure 7e). Surprisingly, we did not observe any reduction in intracellular NAD+ levels upon telomere uncapping in the absence of BNA2. Thus, BNA2 is not required for NAD+ homeostasis in response to telomere uncapping but our data do not formally rule out that increased BNA2 expression boosts NAD+. We attempted to over-express BNA2 from a galactose-inducible plasmid to see if this increased intracellular NAD+ levels, but found that simply growing cells in galactose led to very high intracellular NAD+ levels (data not shown). Telomere uncapping in cdc13-1 strains induces expression of genes involved in de novo NAD+ synthesis and also in NAD+ salvage. Thus, when telomeres are uncapped in the absence of BNA2, intracellular NAD+ levels may be maintained by the NAD+ salvage pathway. Further experiments are required to determine the mechanism by which BNA2 affects telomere capping and whether this is related to its role in NAD+ biosynthesis. Uncapped telomeres are dangerous to unicellular and multicellular organisms as they are precursors to genomic instability . Hence, conserved cellular responses to damaged telomeres have evolved. Telomere damage in budding yeast leads to a cell cycle arrest [1, 6, 22, 47] that resembles replicative senescence induced by uncapped telomeres in mammalian cells [7, 48]. Here we show that, in response to acute telomere damage in cdc13-1 yeast strains, cells mount a transcriptional response that exhibits distinct features and that also encompasses aspects of the responses in yeast to the absence of telomerase , the DDR  and the ESR . Furthermore, the response to uncapped telomeres in cdc13-1 budding yeast strains has features in common with the responses to telomere damage in Schizosaccharomyces pombe  and in mammalian cells . A major question is whether uncapped telomeres are recognized simply as DSBs or whether the cell senses them as a distinct type of damage. The majority of genes altered in cdc13-1 strains have not thus far been implicated in the DDR, showing that the response to uncapped telomeres is not identical to the response to DSBs at non-telomeric loci. The response to telomerase deletion was also sufficiently different to the DDR for the same conclusion to be drawn . Thus, we confirm that the general cellular response to telomere damage is distinct from the response to DSBs. It is noteworthy that, while telomere uncapping in cdc13-1 strains is associated with the differential expression of many genes involved in the DDR, absent are most of those that are known to be critical for the checkpoint arrest, such as MEC1, DDC2, RAD9, RAD24, DDC1, MEC3, RAD17, RAD53 and CHK1 [1, 3]. Many of these are kinases or kinase regulators and, therefore, may not be expected to be transcriptionally regulated. In fact, differential expression of checkpoint genes was not observed in response to ionizing radiation in S. cerevisiae  or S. pombe , suggesting that these genes are primarily regulated at the post-translational level. One exception is the DDR kinase-encoding gene DUN1, which is up-regulated in cdc13-1 strains and in response to other cellular insults [27, 51]. Interestingly, DUN1 is also induced in senescent human retinal pigment epithelial cells with shortened telomeres , suggesting that its altered expression may be a common feature in response to telomere damage. A major feature of the response to telomere damage in cdc13-1 strains and to the absence of telomerase is the induction of genes involved in the ESR. Telomerase deletion in S. pombe is associated with the differential expression of many genes that are also involved in the ESR . A microarray analysis of replicative senescence comparing young human fibroblasts with senescent fibroblasts with shortened telomeres demonstrated that genes involved in stress responses were altered , suggesting that telomere damage in mammalian cells is also perceived as a stress. Thus, it appears that the induction of stress responses when telomeres are damaged may be conserved. BNA2 is highly and significantly up-regulated when telomeres are uncapped in cdc13-1 strains and is involved in de novo NAD+ synthesis . Identification of a functional interaction between BNA2 and a suppressor of cdc13-1 temperature sensitivity, NPT1, suggested that a bna2Δ might also suppress it (Figure 6c). This was confirmed as deletion of BNA2 allowed growth of cdc13-1 strains at 26°C (Figure 7a). That Bna2 inhibits the growth of yeast with telomere capping defects indicates that Bna2 possesses a previously unknown role in the cellular response to telomere uncapping. NPT1 is also involved in the generation of NAD+ . Thus, NAD+ metabolism may be linked to responses to telomere uncapping. In support of this hypothesis, GOstats analysis of genes altered in cdc13-1 strains but not periodically expressed during the cell cycle revealed that genes involved in nicotinamide metabolism were over-represented. It is also noteworthy that genes involved in nicotinate and nicotinamide metabolism were over-represented in the list of genes differentially expressed in senescent human fibroblasts with shortened telomeres . Because NAD+ is required for the activity of Sirtuins, we investigated whether deletion of BNA2 was exerting its effects upon cdc13-1 via modulation of Sirtuin function. Our experiments suggest that this is not the case (Figure 7b,c). It is likely that deletion of NPT1 reduces Sirtuin activity [40, 46]. Reduced Sirtuin function has adverse effects upon cdc13-1 (Figure 7b,c), but despite this, npt1Δ suppresses the temperature sensitivity of cdc13-1 (Figure 7a) . Thus, cdc13-1 suppression in npt1Δ strains is likely also independent of any role in modulation of Sirtuin function. NAD+ is an abundant biomolecule with many roles within the cell. Further experiments will investigate whether the roles of BNA2 and NPT1 in telomere capping are related to other aspects of NAD+ regulation and, if so, how this affects telomere function. Dysregulation of telomere capping is associated with aging and carcinogenesis. To better understand eukaryotic responses to telomere uncapping, we examined the genome-wide transcriptional response to telomere uncapping in cdc13-1 yeast strains. The response to uncapped telomeres in cdc13-1 strains has features in common with responses to the absence of telomerase, environmental stress, and to DNA damage at non-telomeric loci. Induction of stress responses appears to be a conserved feature of the eukaryotic response to telomere damage. The BNA2 gene, involved in NAD+ synthesis, is highly and significantly induced when telomeres are uncapped in yeast, and its gene product acts to inhibit growth of cdc13-1 mutants. From this, and complementary experiments, we conclude that genes involved in NAD+ metabolism play roles in telomere end protection, which has implications for aging and carcinogenesis. All strains used in the microarray study were in the S288C background (Table 4). All strains used for spot tests were in the W303 genetic background (Table 4). Cultures were grown in YEPD supplemented with 50 mg/l adenine. Strains for microarray study were grown in medium derived from a single batch. To construct strains, standard genetic procedures of transformation and tetrad analysis were used . Cultures were grown overnight at 23°C to a density of 3-4 × 106cells/ml and diluted as described previously . Cultures were transferred to restrictive temperatures and no further dilutions were made thereafter. Aliquots were taken at each time point to assess cell cycle arrest, viability and cell numbers as described previously . Samples were harvested by spinning at 3,000 rpm for 2 minutes before being snap frozen. RNA was isolated using a hot phenol method followed by purification using Qiagen (Crawley, West Sussex, UK) RNeasy columns . cDNA was prepared, labeled and hybridized to Affymetrix GeneChip Yeast Genome 2.0 arrays, according to the manufacturer's instructions. Arrays were scanned with an Affymetrix Genechip Scanner. RNA was prepared as described above and treated with DNAse I from Invitrogen (Paisley, Renfrewshire, UK), according to the manufacturer's instructions. RT-PCRs were carried out using the Invitrogen Superscript III Platinum SYBR green one-step qRT-PCR kit, as prescribed by the manufacturer, using an ABI (Warrington, Cheshire, UK) prism 7700 sequence detector. PCR primers (Table 5) were from Sigma Genosys (Gillingham, Dorset, UK) and were designed using the Invitrogen OligoPerfect designer. In all cases, each measurement was performed in triplicate. Correction factors to normalize RNA concentrations of each sample were generated by quantification of up to three loading controls (ACT1, PAC2 and BUD6). Where indicated, the geometric means of multiple loading controls were calculated . CEL files and MIAME-compliant information for those files were stored internally in the CISBAN SyMBA repository . SyMBA is an open-source project that provides an archive and web interface for multi-omics experimental data and associated metadata. Raw data is publicly available from the ArrayExpress website, accession number E-MEXP-1551. To identify significant differentially expressed genes whose expression was altered in cdc13-1 strains relative to CDC13+ at least two-fold during at least one time point in all three replicates, CEL files were loaded into Bioconductor  and the data normalized using RMA. The list of significantly differentially expressed genes used for subsequent analysis was based on the limma contrasts 'm1-w1', 'm2-w2', 'm3-w3', 'm4-w4'. The probe sets with F-test p-value (adjusted using the 'Bonferroni' method for multiple testing) lower than 0.05 are identified as significantly differentially expressed. GOstats analyses  were carried out using GOstats version 2.6.0 and data were subjected to conditional hypergeometric tests with a cut-off of 0.01. Deletion constructs were amplified by PCR from S288C gene deletion library strains, in which genes have been replaced with a KANMX cassette . Primers are described in Table 6. PCR fragments were transformed into the diploid W303 strain DDY145 (cdc13-1/CDC13+rad9::HIS3/RAD9+) as described previously , with an additional incubation for 2 hours at 23°C at the end of the protocol. Transformants were selected based upon G418 resistance and gene deletions were confirmed by PCR, using forward (5') primers (Table 6) and reverse primer 1261 (TCAGCATCCATGTTGGAATT), which anneals to the G418 cassette. Diploids were sporulated, tetrads dissected and progeny selected. Cultures (2 ml) were grown overnight to saturation, diluted to OD600 = 1 and then subjected to a six-fold dilution series in a 96-well plate using sterile water. We spotted 3-5 μl onto specified plates using a 48-prong replica plating device and plates were incubated at specified temperatures for 3 days before being photographed. NAD+ measurements were made using a BioAssay Systems (Hayward, CA, USA) EnzyChrom NAD+/NADH Assay kit. Cultures (2 ml) were grown overnight to saturation, diluted to OD600 = 0.5 in 5 ml and allowed to double. OD600 measurements were taken before cultures were harvested and pellets resuspended in 125 μl NAD+ extraction buffer. Ice-cold acid-washed glass beads (0.25 ml) were added. Lysis was achieved by applying samples to a Stretton Scientific (Stretton, Derbyshire, UK) Precellys 24 for 2 × 10 seconds at 6,500 rpm. Samples were recovered and assays were carried out according to the kit manufacturer's instructions. NAD+ levels in each sample were quantified in duplicate. Correction factors based upon OD measurements were generated to account for increases in cell size after cell cycle arrest and applied to calculated NAD+ concentrations. The following additional data are available with the online version of this paper. Additional data file 1 is a figure showing RT-PCR analysis of heat shock gene expression. Additional data file 2 is a figure showing quality control of microarray strains and samples. Additional data file 3 includes tables listing differentially expressed genes in cdc13-1 strains and genes in QT clusters 1-13. Additional data file 4 includes tables listing results from GOstats analyses. Additional data file 5 is a figure showing expression of HSP12, MSC1 and CTT1 during the microarray time course. Additional data file 6 includes tables listing differentially expressed genes in both cdc13-1 and tlc1Δ and genes altered in cdc13-1 but not in tlc1Δ. Additional data file 7 includes tables listing transcription factor genes up-regulated and down-regulated in cdc13-1 strains. We would like to thank Jürg Bähler for critical reading of the manuscript and members of CISBAN for helpful discussions. We are grateful to Stephen Addinall for help with BioGrid and to Allyson Lister for assistance with the ArrayExpress submission. This work was supported by the BBSRC CISBAN grant (BB/C008200/1). AG designed and carried out the majority of the experiments, analyzed the data and drafted and edited the manuscript. GL, DCS, and DJW processed and analyzed array data. KJ and AW carried out GOstats analysis. LW and HP carried out experiments. DL designed experiments and drafted and edited the manuscript.